+ eight = 12 Required Please enter the correct value. Wearable tech, medical tech, and cybersecurity are three of the most promising tech sectors we like investing in today. And all of those fields were the stars of the South by Southwest (SXSW) Interactive 2015 festival in Austin, Texas, this past week. SXSW Interactive is one of the largest festivals of its kind in the world. More than 32,700 attend the 1,100 conference sessions on technology, digital media, Web audience development, and the future of publishing. Tech innovations are on full display at the festival's exhibition halls, where nearly 600 exhibit spaces are rented. In just four days, more than 65,000 people file through dozens of aisle ways to see demonstrations and product unveilings from robotics, virtual reality, gaming, and more. SXSW sounds like it's mostly for tech junkies, but it's a treasure trove of profit opportunities for investors. It points to where the money will flow. One example – Twitter Inc. (NYSE: TWTR). The site launched March 21, 2006, but it was the SXSW Interactive festival almost a year later that launched the company to fame. Six years after that, the company held one of the biggest social media IPOs ever, raising $14.2 billion. Today, the micro-blogging company is worth $31 billion. The stock has had a bumpy overall run, but has been steadying, with a 60% climb since May 2014. 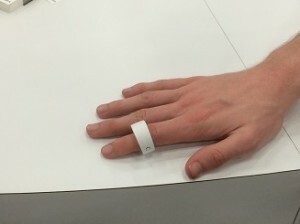 A wearable ring that works as a remote control for smart devices. Wearable technology was by far the largest trend we saw in the Austin Convention Center at SXSW Interactive 2015. That includes everything from fitness products, wearable remote controls, virtual reality headsets, and even a "smart" dog collar. 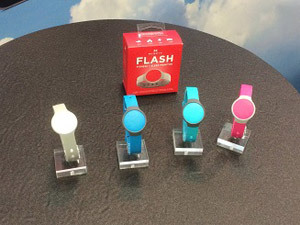 Wearable fitness and sleep trackers were everywhere at SXSW. The research firm IDTechEx estimates sales of "wearables," which includes both external wearable items and apparel, will rise to $70 billion by 2024. Annual sales were $14 billion in 2014. Smart clothing alone is expected to go from practically no sales in 2014 to more than 10 million units in 2015, according the Gartner Group. By 2016, that will reach 26 million. Money Morning's Defense and Tech Specialist Michael Robinson first told investors about wearable tech's potential in 2012. He has made a few wearable-tech stock picks since then – but singling out the winners is tricky. "It's important to note that we're still at the dawn of wearable tech." Robinson said. "It's a bit early to try picking the winners from the losers. What we're looking for now is a way to capture as much upside as possible from the whole sector." That's why he likes Vanguard Information Technology ETF (NYSE Arca: VGT). Apple Inc. (Nasdaq: AAPL) and Google Inc. (Nasdaq: GOOG, GOOGL) make up more than 24% of the ETF's holdings. That right there gives us two major wearable plays. Other major players include Intel, Microsoft, and Garmin. "With its lineup of top tech names – and a concentration in tech's fastest-growing sector – this is a great long-term play," Robinson said. "Vanguard Info Tech is an investment that captures the quick profit potential in wearables while still helping you build a solid investing foundation." Since our recommendation in October, VGT stock is up nearly 16%. The Dow has gained just 11% in that same time.